Upul Ranil Fernando keeps large black garbage bags to store and dispose of huge amounts of beach waste. And he encourages both local and foreign tourists to do likewise as part of a campaign backed by environmentalists and the Catholic agency Caritas to clean up Sri Lanka's coastline. The Negombo coast, along the country's western side, attracts many visitors and it is where Fernando operates. Left behind by sun-seekers are myriad plastic bottles and various other types of trash. Activists work together with local communities to perform beach cleaning regularly and separate recyclable materials, said Fernando while cleaning a beach along with priests, Sunday school children and some of the 5,000 volunteers involved in the campaign. Rukman Kumara Fernando, a community leader, joined a mega beach cleaning campaign organized by Caritas on Sept. 30 covering 35 kilometers of coastline. He said the abundance of rubbish had destroyed an earlier atmosphere of "serenity". It was not merely the refuse dumped directly on beaches, but also debris that flows from canals and rivers onto beaches and into the sea, Kumara Fernando added. Emmanuel Sugath Fernando, a Sunday school teacher, said children were setting a good example for their parents to keep the shore clean. Plastic bottles and polythene damage wetlands and marine habitats, facilitate the breeding of mosquitoes and pollute ground water. The beach cleaning campaign is part of Caritas Sri Lanka's Jubilee year program for 2018. According to reports of the Maritime Environment Protection Authority (MEPA), an average of 13,000 pieces of plastics per square kilometre are floating on the surfaces of the world's oceans. 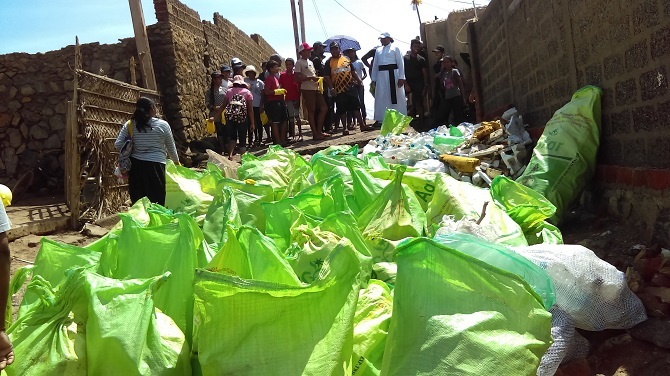 People just throw out polythene, plastic and other materials onto roads as well as onto public and private land from where it often eventually ends up in rivers, lakes, lagoons and the ocean. Nearly 7,000 metric tons of plastics are dumped in Sri Lanka annually, but only about 3,000 metric tons of this amount is disposed of properly. Hemantha Withanage, director of the Center for Environmental Justice, said that according to various reports, Sri Lanka is one of the worst nations in the world when it comes to dumping garbage into the sea. He said plastic bag usage needs to be cut worldwide. And he noted that nearly 20 million shopping bags are used in Sri Lanka daily. "There are two 'plastic patches' flowing in water of Atlantic Ocean which are larger than New Zealand," Withanage said. "Everyone is seeking solutions for this." Sri Lankan government policies should discourage plastic and polythene usage, he said, while also urging that consideration be given to introducing a cash payment for bottles being returned for recycling. Sri Lanka has banned the use of polythene of 20 microns or less to minimize environmental impacts. But environmentalists say much more needs to be done, including the continuous conducting of public awareness campaigns as well as the introduction of new laws.